Picture yourself vacationing in this magnificent and upscale 6,000 square foot oceanfront home. The stunning house is comprised of 4 bedrooms and 4½ baths with a variety of features including an atrium entry with cathedral ceilings, skylights, a large living room, delightful family room, convenient indoor and outdoor dining, and a game room with a fully equipped bar. You will enjoy a spacious, open floor plan, with all but the master bedroom on one single level. Benefit from the heated swimming pool with a beautiful waterfall. Only steps away from a private sandy beach, the short stroll along the oceanfront leads you to a reef-protected beach cove lagoon which is suitable for swimming, snorkeling, and playing in the sand. Abundant tide pools dot the lava rock shelf fronting the homes in the area. Beach chairs are provided for your leisure. Enjoy the turtles, dolphins, and whales! The splendid property is located in the prestigious, gated and 24-hour security-guarded community in Kailua-Kona, situated directly facing the deep sapphire blue waters of Kona Bay. You can walk to the tennis courts or into Kailua-Kona for entertainment, dining, and shopping. Just a few minutes’ drive to the south are the world-famous Kona coffee plantations, snorkeling bays of Keahou and Kealakekua, and historic sites including the City of Refuge and the Captain Cook Monument. There are several golf courses, play fields, movie theaters, and other recreations in Kailua-Kona within a few minutes’ drive. The sandy swimming beaches and resort areas of Hualalai, Waikoloa, Mauna Lani and Mauna Kea are an easy 20-45 minute drive up the Kohala coast. Indulge yourself in this magnificent private retreat for that special get-away, small family gathering, entertaining, or just plain relaxing. Spacious room featuring a custom dolphin-motif stained glass window, oversized marble Jacuzzi spa, double vanities, a large double-head shower, walk-in closet, and a private lanai off the master suite overlooking the spectacular ocean. Both bedrooms feature ceiling fans, seating area and private bathrooms. Private, attached, spacious unit comfortably sleeps four. Can be used as an additional bedroom. KITCHEN - The gourmet kitchen is fully stocked with cookware and utensils. Just bring your food! HOME OFFICE - A convenient home office provides you with all the necessities to stay in touch while on vacation, including a desk, printer/copier. Free High speed internet access. Just bring your laptop or ipad or android device! GAME ROOM/BAR - Conveniently stocked with ice maker, wet bar, beverage fridge, glassware, blender, game table and games and books. ACCESSIBILITY - The kitchen and dining room are elevated a few steps but there is a ramp from the pool deck to the kitchen which makes the entire lower level with pool, patio, living room, den, bar/game room, 3 bedrooms and 3.5 bathrooms all very accessible. Imagine, instead, exiting the airport with your bags and being greeted by a driver with leis and a sign with your name. Your luggage is then stowed in the waiting car by the driver. Upon entering the car, cold water and Hawaiian chocolates await you. You are whisked away to the home, and, upon arrival, the driver helps carry your bags into the home. Waiting for you at the home is your pre-arranged, rental vehicle and groceries for your stay. Email or call for more information on this additional. The location of the home being so close to downtown activities and dinning as well being hidden and off the main street. Beautiful setting and quiet location. With a well laid out floorplan and lots of room. All linens & towels provided, including beach towels. We do provide wireless internet, but please note due to area location the connection is not always consistent. Absolutely beautiful property! Everything went very smoothly with the assistance of Dominique...all requests were made quickly and without hesitation! The home was well equipped with everything you needed in the kitchen, bedrooms, pool, etc.!! The views and sunsets were stunning....in fact we had so much fun at this house we did not even go anywhere! We hope to return in the future! This is our second time staying at the dolphin house. It was fabulous again! This house is wonderful. There is nothing lacking.. everything you could want or need in the kitchen, bedrooms were great, outdoor space was perfect for every meal. There were nine of us from 70 to a toddler and having the pool delighted both the adults and the kids. The views and sunsets were spectacular and the beach close just down the path was a plus. The property is very secure and safe. Also, the owner and agent were very prompt to answer any questions. We thoroughly loved it and were sad to leave. Aloha and Mahalo!!! We stayed at the Dolphin House in early February and absolutely fell in love with it. It is such an amazing property and has an unbeatable view. It's a short walk into Kailua where there is an abundance of restaurants and shopping. The owner is easy to work with and handled everything for us. We will be back again for sure! Fabulous House with Everything and an Amazing Oceanfront View! This is a great property, with a gorgeous oceanfront view! We took advantage of the offer to have a chauffeur meet us at the airport for a special treat. Unfortunately, my husband couldn't take the limo because he had to pick up the car, but he did get to go to the rental counter without having to haul luggage! The grounds and pool are well kept, and the house has an incredible "bringing the outdoors in" feel to it. During the day, the ocean breeze cools the house wonderfully, although in the evening, the air can sometimes be rather still. All the bedrooms have A/C and the master has the same great view of the ocean as the living area downstairs. Although the jets on the spa tub in the master were not working at the time of our visit, we did enjoy soaking in the tub after a long day of traveling. The house is very well stocked with everything imaginable. Beach towels are plentiful, wonderfully plush, and appear new. Spices of almost every kind are in the kitchen, along with staples like flour, sugar, and Keurig coffee! And of course plastic wrap, foil, and Ziploc bags to keep the bugs away. Speaking of bugs, we were delighted not to have been bothered by any during our stay. The small community feels safe, with security guards patrolling 24 hours a day (important because there is a public path to the beach that runs along the shoreline behind the houses). As for things to do, (as if staying at the house wasn't enough!) there are tide pools right behind the property and the beach is a short walk away. Be careful climbing down to the path from behind the house if you decide to go that way. If you decide to wander further, the house is stocked with plenty of boogie boards, beach chairs, ice chests--everything you can imagine needing for a trip to Hapuna or Magic Sands. Be sure to check out the supplies before buying or renting any beach toys. It will save you a lot of money! And the ice maker machine in the bar is perfect for stocking the ice chest with ice to keep all your drinks cold at the beach! Oh, and not to mention there are plenty of flashlights throughout the house. They are great for a walk to the beach after sunset, or take a few with you if you go to see the volcano erupting at night. All in all, we thoroughly enjoyed our stay at Dolphin House. We did run into a few hiccups the first day, but Dominique was wonderful and Greg got things sorted out for us. After that, everything ran very smoothly and we had a marvelous time! Thanks! This was our third time staying at the Dolphin House, and we were only there for a few days before we booked the house for the summer of 2018. This says a lot for how much we love this house. It has everything you could ever possibly want or need, just a few steps from the pool and the beach, and neighbors are very friendly. There is something to do for all ages, we are ages 85, 63, 45, 39, 36, 26, 11 times 2. Must see for yourself. RIGHT ON THE OCEAN!!! Just steps down beach path to the crescent shaped White Sand Beach & Lagoon for ocean swimming and snorkeling! Private Oceanfront Pool, Waterfall, Lush Landscape, Private, Outdoor Gas BBQ, Ceiling Fans, Phone, Cable TV, VCR and Stereo CD/DVD Player. Free HIGH SPEED internet. Beach toy box full of rafts, floaters and pool toys. Dream Kitchen is completely stocked with everything needed to make gourmet meals. 2-Ice Makers, 2-Convection Ovens, 6-Stovetop. Gorgeous white, black and even green sand beaches, lush tropical valleys, rain forests and arid lava landscape await your discovery. It's an incredible adventure. Come to the Big Island and experience the Aloha spirit--come be our guest! 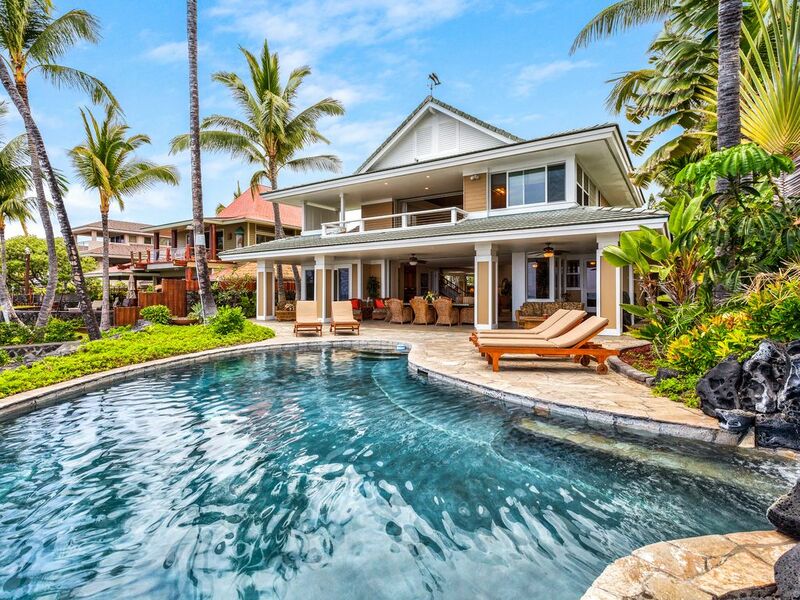 Short ten minute drive from the Kona Airport to your magical Hawaiian vacation home. NO PETS, NO SMOKING & NO HOUSE PARTIES.